Hi! 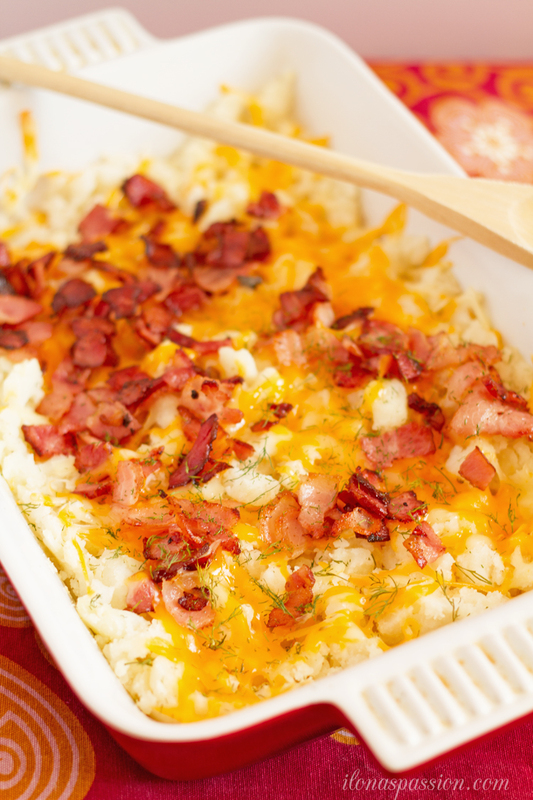 This is Ilona from Ilona’s Passion coming here with a new easy recipe for dinner – Colby-Jack Cheese And Bacon Mashed Potato Casserole! 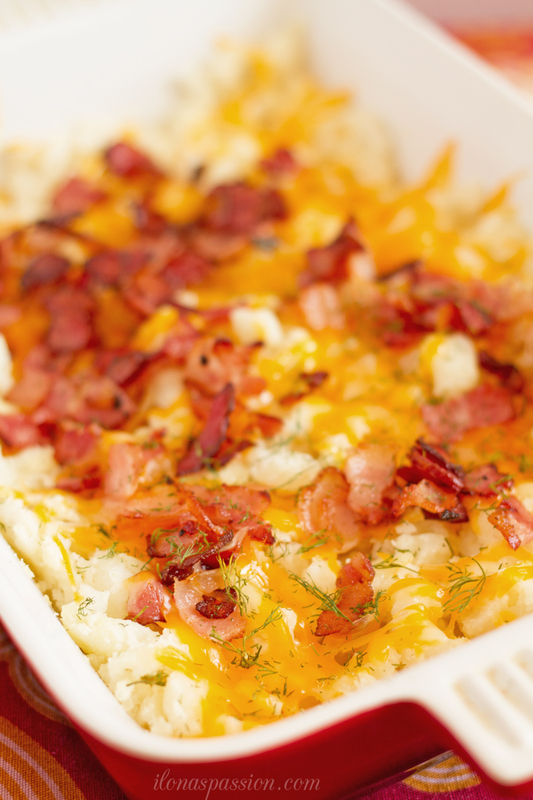 Tasty bacon mashed potatoes are topped with Colby-Jack cheese and dill. Whenever I am in a restaurant I always order loaded mashed potatoes topped with cheese and bacon. They also add chives on top. I like them that way. Potatoes are my favorite and I make them often at home. When I am out of potatoes I am running to the store to pick them up. 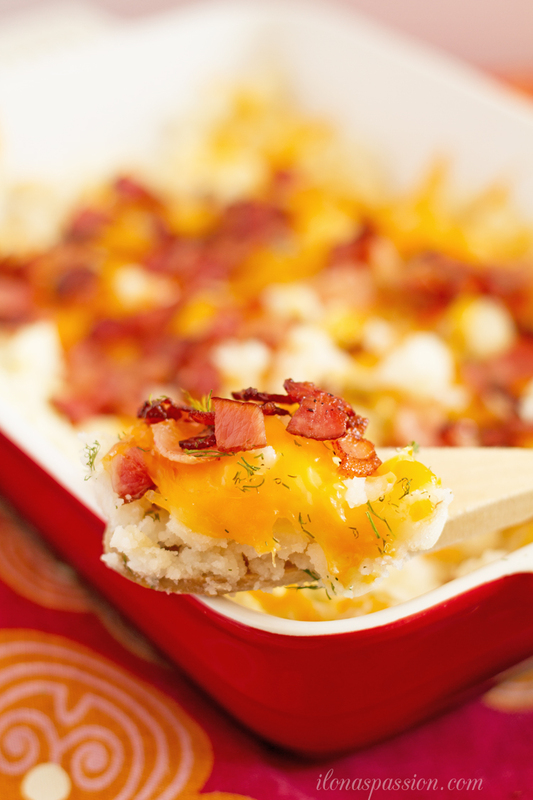 A mashed potato casserole is a perfect addition to any dinner – great for parties too. You can make potato stacks, potato wedges with delicious dip or scalloped potatoes – endless possibilities. They are the best and I have to admit I prefer them over rice, pasta or quinoa. My mashed potato casserole is prepared in an easy way. I had leftover potatoes from yesterday and I decided to to do something different with them. Instead of just reusing them or making gnocchi (that I always make) I prepared them with cheese, bacon and dill. First, I made layers in my deep dish. On the bottom of the dish, I put mashed potatoes, then the Colby-Jack cheese and topped with cooked bacon. I also sprinkled the top with dill. Bake in the oven for about 20 – 30 minutes and my tasty dinner was done…they didn’t last long! If you are looking for additional easy weeknight recipes don’t forget to check out this Taco White Kidney Beans Casserole and Easy Chicken Soup Recipe. They are delicious and I make them a lot for weeknight dinners. Season mashed potatoes with salt and pepper. Lay mashed potatoes on the bottom of the deep dish. Add colby jack cheese on top. Set aside. Cut bacon into small pieces and cook on frying pan for about 10 minutes. Add on top of the cheese. Sprinkle with dill. Bake for 20 - 30 minutes. If you are looking for more delicious recipes follow Ilona’s Passion, on FACEBOOK, PINTEREST, GOOGLE+, INSTAGRAM, and TWITTER. I’ve always wanted to make something like this….why haven’t I? Looks insanely delicious! I could face plant into this right now! You had me at bacon… and potatoes…. and cheese. Oh the whole thing sounds great. Thanks for sharing on Creative K Kids Tasty Tuesdays. MMmmmm – Bacon……… This looks amazing! Thanks for sharing on the “What’s for Dinner” link up! I’m a huge potato lover as well – I’ll get a huge bag and just eat them various ways for lunch all week! Can’t beat the price, either!